Beef Brisket $9.99 – Traditional beef brisket dry rubbed and smoked for 12 hours. 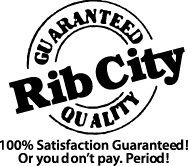 The Rib City® Steakburger $8.89 – A fresh, hand-patted 8-ounce burger, grilled to your order with lettuce, tomato and onion. Grilled Chicken Sandwich $8.89 – A fresh chicken breast brushed with our sweet sauce then grilled. Served with lettuce and tomato. Smoked Sausage Sandwich $9.39 – Smoked, grilled and brushed with our sweet BBQ sauce and served on a toasted bun. Ask your server about adding it to a Combo! St. Louis Style Ribs $15.29 – If you like traditional Spare Ribs, you’ll love these closely trimmed ribs. Something you can sink your teeth into! Beef Brisket $15.99 – Traditional beef brisket dry rubbed and smoked for 12 hours. Bar-B-Q Pork Plate $8.79 – Smoked until moist and tender, sliced thin. Bar-B-Q Beef Plate $8.79 – Wood smoked Beef Eye Round, sliced thin and piled high. Bar-B-Q Chicken Plate $8.79 – 1/4 Chicken basted in our sweet barbecue sauce. Smoked Turkey Breast Plate $8.79 – You’ll love this Rib City favorite sliced thin. Beef Brisket Plate $10.29 – Traditional beef brisket dry rubbed and smoked for 12 hours. Baby Back Rib Plate $9.79 – 1/2 Rack, so tender the meat just falls off the bone. Smoked Sausage Plate $9.49 – Smoked sausage links grilled and brushed with our sweet BBQ sauce. Chicken on the Greens $9.49 – Our fresh garden salad topped with a grilled, sliced chicken breast. The Rib City® Club $10.19 – Our fresh garden salad topped with sliced smoked turkey, our shredded three cheese blend & real bacon bits. Chocolate Cake $5.99 – Homemade chocolate cake covered in real chocolate buttercream frosting! Homemade Carrot Cake $5.99 – Towering carrot cake, baked daily, covered in homemade cream cheese frosting.